Sitting at the intersection of Facilitation, User Experience, Innovation & Design, I have spent the better part of the last 20 years working with organizations to define, design and develop strategies or solutions to fit their organization’s challenges and then implement them. I’ve worked with organizations from small sole-proprietorships up to some of the largest organizations within Canada, across a broad range of industries. I currently lead Technology Experience Strategy where I'm helping redefine how we deliver IT services & technologies to employees at a major Canadian bank, a proud father of two boys and an avid photographer. I know, I know – half of you clicking through just cringed when you read the term “personal brand” – I’m not a fan of the term either, but up until now I’ve been hard pressed to find a term that summed the concept up better. 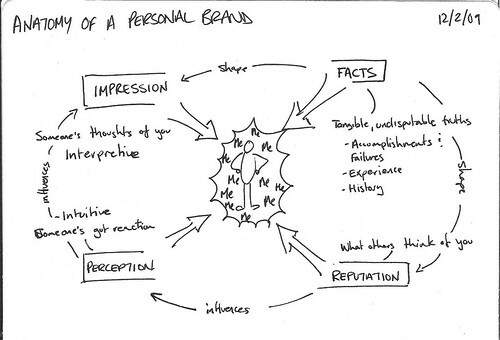 Also, I’m approaching this thought exercise not from the notion that you can directly control or shape a ‘brand’ for yourself but rather trying to understand what the underpinnings of the concept are and how someone can ensure they’re putting the right foundation out there for people to build their own impressions, and thus your “brand” on. For the specialists of the world I’m not sure this is as big an issue, but I think a lot of generalists (like me) struggle with it. As I’ve pondered on my blog in the past here, it’s not always clear to me exactly what it is I do, and if it’s not clear to me I can only imagine how messy it gets when other people try to form opinions or thoughts about what it is I do. Ultimately as I dug into the visual though and tried to create a more refined version I realized what I was drawing here was actually more a representation about how individuals form opinions about you and didn’t speak at all to how the greater collective opinion (a.k.a “Personal Brand”) got formed. So, instead, I moved away from this circular idea and tried approaching this from the bottom up. For this visual I started at the bottom, the foundation – Facts & Fictions. Everyone’s opinion is based on their perceptions of impressions of the baseline facts and/or fictions available to them. Perceptions are the intuitive feelings people get – gut feeling, sensing, etc. whereas Impressions represent the interpretive side, where someone makes deliberate judgments based on the ‘evidence’ before them. Both perceptions and impressions can influence each other and they roll up to form the individual’s opinion, which in turn gets added to a Collective Reputation based on the individual opinions of the masses. As with most things, context with everything – we don’t have one single collective reputation. Your collective reputation will change depending on the lens you’re being viewed through – i.e. Your collective reputation in the context of “Trustworthy” might be dramatically different from that of the context of “Can Fix Cars”. That said, the contexts are not exclusive, if I’m considering who I want to have fix my car I would consider both “Trustworthy” and “Can Fix Cars” in making both my decisions (and if you screw up my car or screw me on the bill both could be affected). Also, there’s no standard “reputation” for any context – each collective reputation is formed by the individual’s networks and their opinions of the individual people who make up that network. For example, if my view of the collective reputation of person X is that he’s not very trustworthy then I’m not going to weight his opinion of Person Y as highly as I would someone else more trustworthy. Facts & Fictions are the only place you have any control and even then, you only have the power to create new facts or fictions. Fictions are unsustainable though and will ultimately lead to negative Facts being created, and you can’t ‘delete’ those. All in all, I’m happy with where this visual is headed – I think there’s a few other visuals that can do with some exploring as well including; context, weighting & how you go about evaluating and improving on the collective reputations you have today. 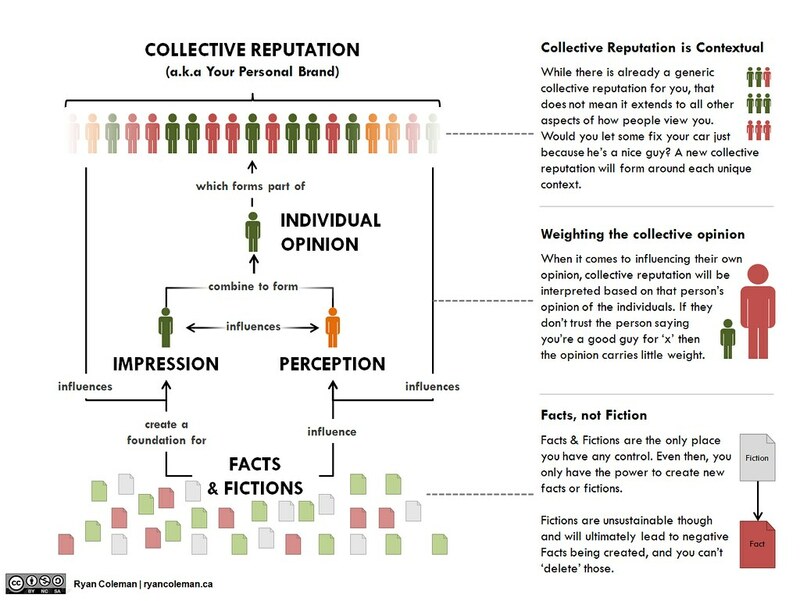 I also like the emergence of the term “Collective Reputation” – I’m not 100% sure it’s the perfect terminology but it sure sounds a whole lot better than personal brand. What are you thoughts or comments? Share them below. Tonight I had the opportunity to speak at #IgniteTO, Toronto’s local gathering under the Ignite umbrella. This was the second ignite, following a highly successful, and entertaining evening back in September. For my talk I decided to take my FITC presentation from earlier this year (a 90 minute talk) and distill it down to its key points so I could summarize it in just five short minutes. View more presentations from Ryan Coleman. They record all these Ignite talks so when the video is up I’ll be sure to post it here too. As a freelance facilitator and information designer, I can help your organization discover, define and develop your story so you can share it more effectively – If your organization could benefit from better explaining what it is you do, then I can be of help, contact me today. 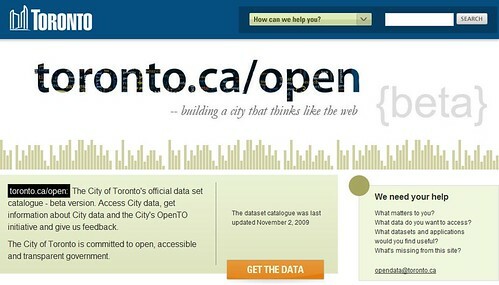 Yesterday Toronto’s Mayor, David Miller, officially launched the city’s Open Data project (#opendatato) as part of the Toronto Innovation Showcase taking place November 2 & 3. Originally announced at the mesh conference earlier this year, it’s great to see this initiative come to fruition finally. As part of this launch Mark Kuznicki (a.k.a @remarkk) was asked to come in and facilitate an event called the “Open Data Lab” where interested developers and citizens could get informed about what the initial datasets contained, how to access them and to provide feedback on what else they wanted to see. Mark asked myself, and several other volunteers to join him in facilitating this session. 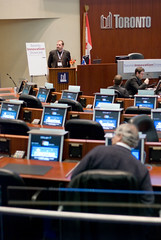 After a series of presentations, intended to inspire the participants and get them thinking about innovative uses & applications for this data, we moved to the members lounge (attached to the City Council chambers) and began the ‘learn’ portion of the event. 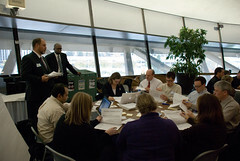 In this section the participants were divided into 6 separate groups (one for each dataset that had been released). Taking cues from the speed-dating format, a subject matter expert (SME) associated with each dataset spent 10 minutes with each table, detailing what data they represented and answering any questions that the table might have. At the end of 10 minutes each SME moved to the next table and the process repeated itself. After a little more than an hour everyone in the room had had the opportunity to get a little face time with each of the datasets and their SME, have their questions answered and, most importantly really get the gears grinding on ideas for what was now possible. From here we moved into the third and final stage: Ideate. 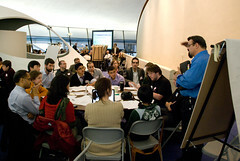 The entire group was brought back together and people were invited to share their ideas and inspirations. These ideas were captured and then each was assigned to a table in the room. Participants could choose which conversation they wanted to participate in and for about 20 minutes some intense and interesting conversations took place as ideas were vetted and expanded on. What datasets does it require? What do you need most to make it happen? All-in-all the afternoon was an interesting process to watch unfold. There were certainly a lot of unknowns, would anyone show up (and if yes, who would they be), would they stay around for the interactive portion, would they engage and ideate or will it devolve into a conversation of everything that is “wrong” with the initiative? Thankfully people did show up and it was a great mix of people, from hard-core coders, to very non-technical people who just had an interest in more access to information. The group I was with during the learn portion had a lot of great ideas and questions and really put the city’s SME’s through the ringer (in a friendly, positive way) and for the most part the SME’s had the answers. What I took away from the event: First off, the city staff who are responsible for publishing this data are all over it and seem to be behind the idea 100%. That said, they even admit that there are parties within the city’s bureaucracy that would rather not put a lot of data out there, especially anything that allows people to analyze and form opinions on how certain departments or elected officials are performing. The apolitical nature of the content that was released was brought up several times. The three big themes that emerged for me: People want more data, in real-time in a standard format. I spoke with some of the co-facilitators after the event and many of them noticed similar trends in the conversations they were a part of. I think what was presented yesterday was a great start and everyone around the table admits and agrees that there’s still a lot of work ahead. To make this work, the city is going to need to learn to live a bit outside their comfort zone on this one (as I think they’re already starting to do), and I have no doubt that the Toronto tech community is going to help drag them out there. From June 8-12, 2009 the MaRS Discovery District here in Toronto, ON ran an event called “Netchange Week” (http://netchangeweek.ca), a week-long event designed to explore how social technology can bolster social change. As part of this week I was invited to come run an afternoon workshop on social media and how to effectively define success in a way that could be measured. Working with Chris Berry from Critical Mass we collaborated on a two-part session – the first, a talk by Chris on practical social metrics followed by a facilitated session where I broke the attendees into groups and they took what Chris had presented and applied it to some example scenarios. View more presentations from gcahill. As a freelance facilitator and information designer, I can help your organization discover, define and develop your story so you can share it more effectively – If your organization could benefit from better explaining what it is you do, then I can be of help. Contact me today. Yesterday I came across a post entitled “10 Photography Quotes You Should Know” by Hákon Ágústsson at the Digital Photography School. It had some great nuggets in it but it struck me as the sort of thing that really needed some visuals to go along with it – after all, what fun is a bunch of photography quotes without photos? Long story short, I had a little free time this morning and decided to put a slide deck together – it was a fun little personal exercise and I hope you like it.I sourced all the photos form Flickr under the Creative Commons license and I’ve put this deck out there with the Attribution, Non-Commercial, Share-alike license as the strictest of the photos (that weren’t mine) requested. View more presentations from rycoleman.